Kalivaki, located in Makriotika village, is nestled inside an olive grove. 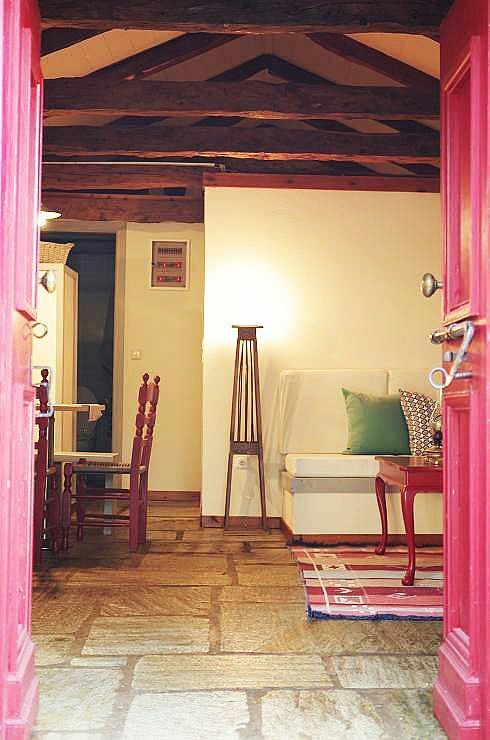 This renovated stone cottage combines the opportunity to experience Greek village life and still enjoy the peace and quiet of a Greek cottage holiday. In the village square, about 2 minutes walk, you will find a friendly tavern and a cafe with a nice view and a mini market. Further shopping facilities, super market and bakery in approx 1km. A wider selection of amenities are within a five minute drive in the nearby villages and Agia Efimia. The fabulous beach of Myrtos can be driven to within 10 minutes. Scuba diving,water ski, horse riding and numerous walking paths are available in the area. EOT approved (Greek Tourism Organization). License number: 0458K91000360301. Bathroom with shower, wc, washbasin. Towels (including beach towels) are provided and can be changed by the renters whenever they like, without the need of having to clean them. Living-dining area with two build in L-shape sofas, coffee table, fireplace, air conditioning, TV, DVD player, CD player, Radio, DVDs and CDs. Notes on accommodation: We supply a free welcome pack on arrival. Private parking inside a gated entrance. Outside: BBQ, patios, terraces, sunbeds, outdoor furniture. Cleaning / Towels / Linen / Maid service: Towels (excluding beach towels) and linen provided. The property is cleaned at the change day.Towels and linen are changed by the renters when ever they like, without the need of cleaning them. Maid service during a stay can be arranged by request. Other: Unlimited free access to Internet. We went to Kefalonia expecting the typical August crowds. This cottage was a huge part in helping us relax and have a great time. Communication was great from booking through check out. Cottage was small but had everything one might need. Wine, water and fresh fruit were there when we arrived. We enjoyed long relaxed breakfasts under the olive trees right outside the front door (oil from the olive trees was available in the cottage), we had a barbecue to ourselves that we did not use. The cottage itself was clean, safe and very charming still retaining the original 18th century architecture. It is 10 mins from Mirtos, one of the most spectacular beaches in the Mediterranean, within 10-15 mins from Ag. Efimia and its beaches. You can rent a boat from Ag. Efimia or Fiskardo (45 mins away but worth the drive) and enjoy essentially countless "private" beaches all day or cross over to Ithaki for lunch! Great vacation and the cottage was an essential part! Would book again if we ever come back in kefalonia! A 10 minute drive west of Kalivaki is Myrtos Beach - voted one of the top ten beaches in the world. 25 minutes to the east of the cottage is Antisamos Beach - the location for part of the film set of Captain Corelli's Mandolin - an ideal place for snorkelling. In Agia Efimia, 5 minutes driving from Kalivaki, there are numerous small beaches and coves, some can only be reached by hiring a motor boat and so will give you the seclusion you may wish for. Kefalonia Airport is approximately 40km from Makriotika, about 50 minutes driving. The port of Sami is a 15 minute drive from which you can catch a ferry to the beautiful island of Ithaca, to Patras on the main land of Greece and to Italy. A local bus service runs to Myrtos Beach and in the villages in the valley (further info. available at the tourist office in Agia Efimia). Should you wish to explore the island a hire car is recommended. Taxi are readily available. The capital of Kefalonia, Argostoli, with its wealth of shops, restaurants and bars, plus the Archaeological Museum and Corgialeneion Historical and Folk Art Museums is 30km. A 15 minute drive away is the Port of Sami which has a medical centre. The fascinating Drogorati Caves are 11km away and the Mellisani Underground Lake, just outside Karavomilos is 6 km. To the south of the island Poros is 30km and Skala 40km. To the north spectacular Assos is 10km and picturesque Fiskardo is 30km. Agia Efimia has several supermarkets, 2 bakeries, a post office, a chemist, a cash point, numerous tavernas, bars and coffee bars. One can hire cars and mopeds and motorboats in the village and book tennis courts and scuba diving or water ski lessons. The municipality of Pylaros, in which Agia Efimia is located, offers numerous enchanting walks both in the valley and the surrounding mountains with breathtaking views and wonderful varieties of flora and fauna. Local villages, such as Dendrinata and Drakapoulata, offer an insight into unspoilt Greek rural life and numerous buildings and sites of historical interest. We recommend a trip to Mount Enos, Kefalonias highest mountain, to enjoy spectacular panoramic views of Kefalonia and other Ionian Islands. Stop for some local wine-tasting at the village of Frangata. Follow the dramatic cliff and mountain road to Myrtos Beach, then wind down in the atmospheric little harbour of Assos. Take a boat trip from Sami across to nearby Ithaca or take the twice-daily boat trip from Fiscardo to explore Lefkas. Explore the fishing port of Fiskardo for its smart yachts and charming narrow streets of Venetian-style houses. Native to Kefalonia are some of the best beaches in Greece. Hire a small boat and spend the day visiting tiny isolated beaches and coves all along the pretty coastline. Drive along the main coastal road to Sami and stumble across small scattered beaches amongst the rocks. Much of the busy nightlife in Kefalonia is concentrated in the main town of Argostoli. The central square is lined with many restaurants, cafes and bars. In Kefalonia you will find an abundance of spectacular scenery, traditional tavernas, stunning white beaches and warm, friendly Greek hospitality.